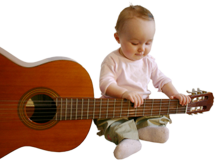 Little Nightingales Music Together - All classes are taught by Kelli Shrewsbury Lewis. All classes are taught by Kelli Shrewsbury Lewis. Kelli is thrilled to be back in Indiana so she can share New York’s most popular early childhood music program with her hometown! 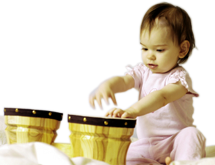 She discovered Music Together® when her daughter was just 13 months old, while living in New York City. She immediately fell in love with the program as she watched the amazing musical leaps her daughter took that very first semester. As soon as possible, Kelli took the teacher training program and became a registered Music Together teacher. She taught for 3 ½ years at one of the largest centers in New York and was lucky enough to train and work with many different teachers, all with unique styles. Kelli has a Bachelor of Fine Arts degree in Musical Theater from Millikin University. As a member of Actors Equity Association she has performed in countless musicals and theatrical productions across the country. Having studied vocal technique in college and throughout her musical career in New York City, Kelli has sung professionally in such diverse styles as jazz, pop, rock, gospel, and cabaret. Her training in dance and gymnastics make her especially qualified to focus on the movement elements of the Music Together collections as well. As a member of the acclaimed vocal jazz octet, Pieces of 8, Kelli performed in concerts across the country and had the opportunity to record four albums with the group. Her experience with Pieces of 8 also included presenting workshops, master classes and educational programming for students of all ages. Since moving back, Kelli has really enjoyed becoming active in the community. She is the co-chair for CarmelFest Has Talent (the talent show for CarmelFest on the 4th of July), she worked with Chaucie's Place giving presentations in elementary schools for their Body Safety program, she also taught gymnastics at Deveau's School of Gymnastics. She can be found most weekends singing with her band, That's What She Said, or cheering on her kids at a Carmel FC soccer game or wrestling meet. Join Kelli on her quest to help families find the joy of making music together.